This chapter introduces a new temporal learning rule, namely the Precise-Spike-Driven (PSD) Synaptic Plasticity, for processing and memorizing spatiotemporal patterns. PSD is a supervised learning rule that is analytically derived from the traditional Widrow-Hoff (WH) rule and can be used to train neurons to associate an input spatiotemporal spike pattern with a desired spike train. Synaptic adaptation is driven by the error between the desired and the actual output spikes, with positive errors causing long-term potentiation and negative errors causing long-term depression. The amount of modification is proportional to an eligibility trace that is triggered by afferent spikes. The PSD rule is both computationally efficient and biologically plausible. 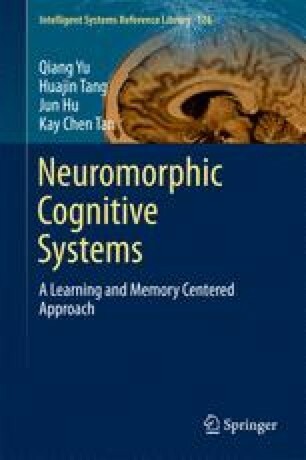 The properties of this learning rule are investigated extensively through experimental simulations, including its learning performance, its generality to different neuron models, its robustness against noisy conditions, its memory capacity, and the effects of its learning parameters.